THE WRIGHTS OF LOSS: AN OCHIL FAMILY. Away back in the time of James the First of Scotland; two gentlemen of the court were so left to themselves as to quarrel. One had the misfortune to kill the other. The slain man was a favourite of the King. So, like Moses when he had killed the Egyptian, this equally unfortunate slayer, John Wright of Burnturk in Fifeshire and “Atheray,” in what is now Stirlingshire, had to flee from the Royal wrath. 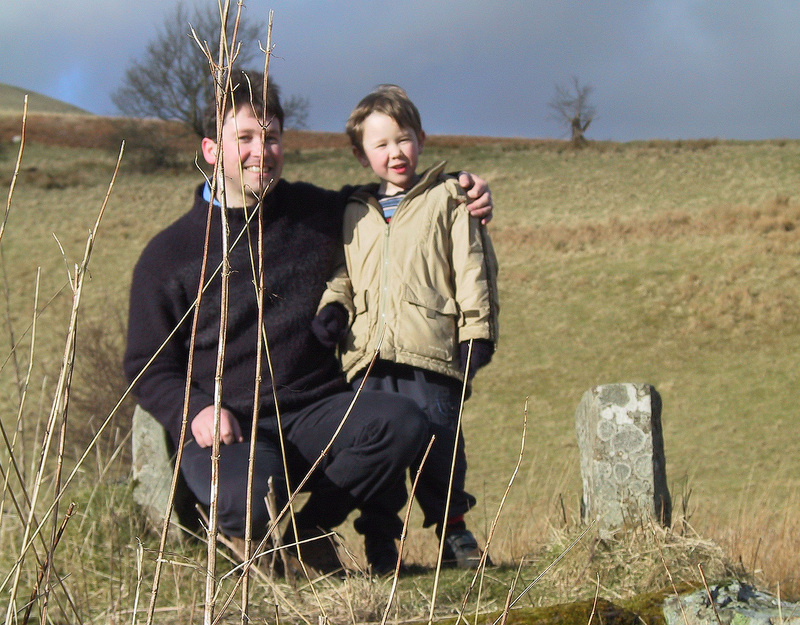 He lost his estates and never returned to Scotland; but his son did, and endeavoured to regain the family possessions. 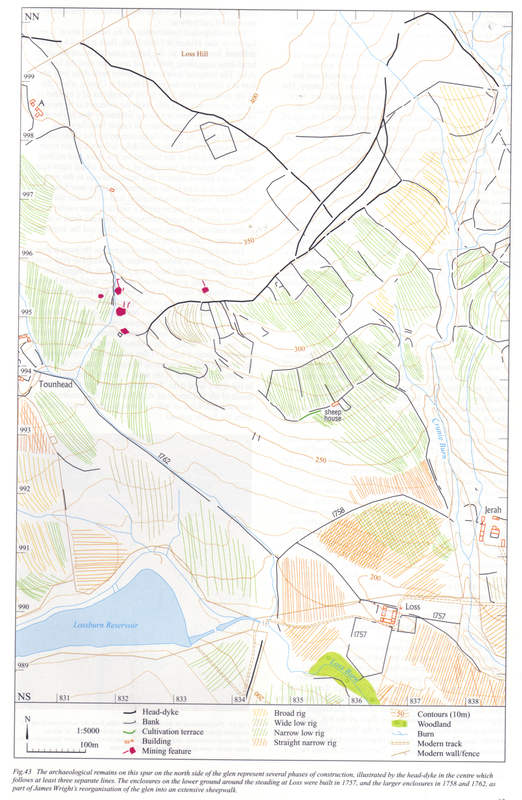 Failing in this, he settled in Inverallan in our own neighbourhood, married well, and became the ancestor of a race from which finally emerged in the early years of the 17th century one James Wright, born about 1615, whose “habitat” was probably in or about Inverallan. 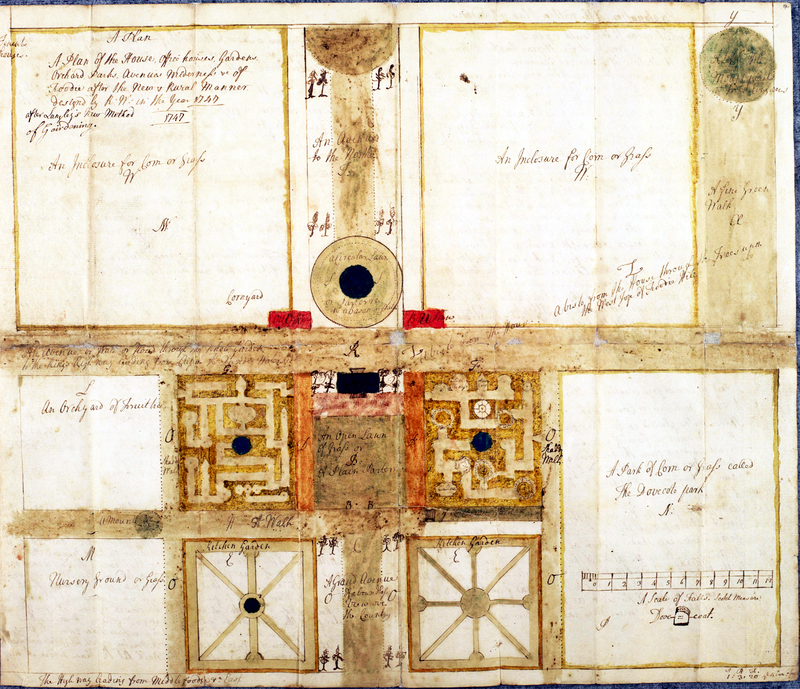 This James Wright must have been a person of means, for when he grew to man’s estate he made very extensive purchases of land. 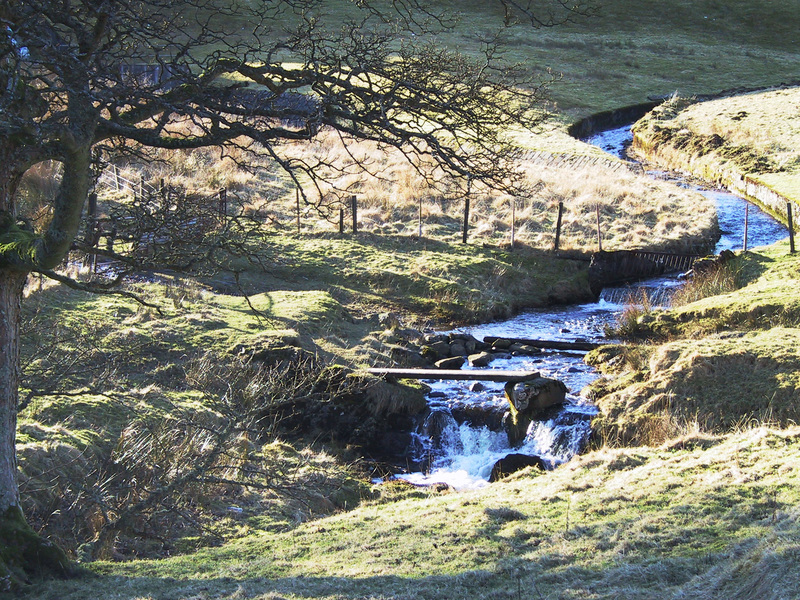 He bought the lands of Loss, Ashentrool, Cauldhame, Haughead, and Drumdroulls, a tract of country extending right over the Ochils from near Menstrie to the Wharrie Glen in the neighbourhood of Sunnylaw, Bridge of Allan. Doubtless any lady would have been “daft to refuse the Laird” of such a goodly heritage. At least Miss Elizabeth Linton, of the proud family which then owned the Pendreich estate, considered that when James Wright offered to make her the lady of the manor she would be by no means marrying beneath her. So they were happily married, and in due time begat a large family of sons and daughters. 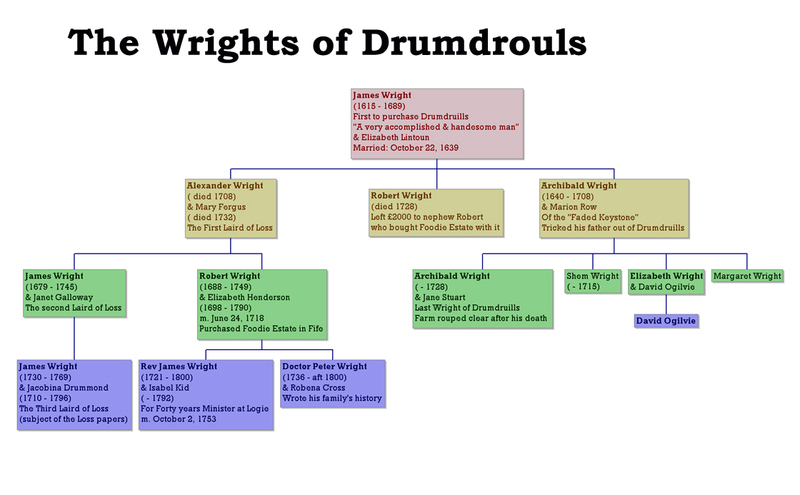 Of these, one was Archibald Wright, not the eldest son, but the man of whom the mysterious Drumdroulls stone speaks. The old parchment which I have referred to, written by a Wright of a later day, says that Archibald Wright, though a younger son, “tricked” his father out of Drumdroulls. But this Jacob the Supplanter, like the Biblical Jacob, must have prospered, for he too made a good marriage, uniting himself to no less a person than Marion Row, a young lady of the notable Inverallan Family, and a descendant of John Row the Reformer. Then in the joy of his heart, and in the pride of good ancestry on the side of both husband and wife, he built him an house, and set in its walls his stone of remembrance, A.W. 1652 M.R. And thus the old paper tells the secret of the old stone. The “trick,” whatever it was, must have taken place during the lifetime of Archibald’s father, who did not die till 1674. We must leave Archibald the trickster, however, and follow the fortunes of the main line of the family. Alexander, the eldest son of the James who purchased so many acres, though he did not inherit Drumdroulls, yet on the death of his father fell heir to the lands of Loss, Ashentrool, and Cauldquhame. All the Wrights seem to have had good sense and circumspection in the matter of their marriages. 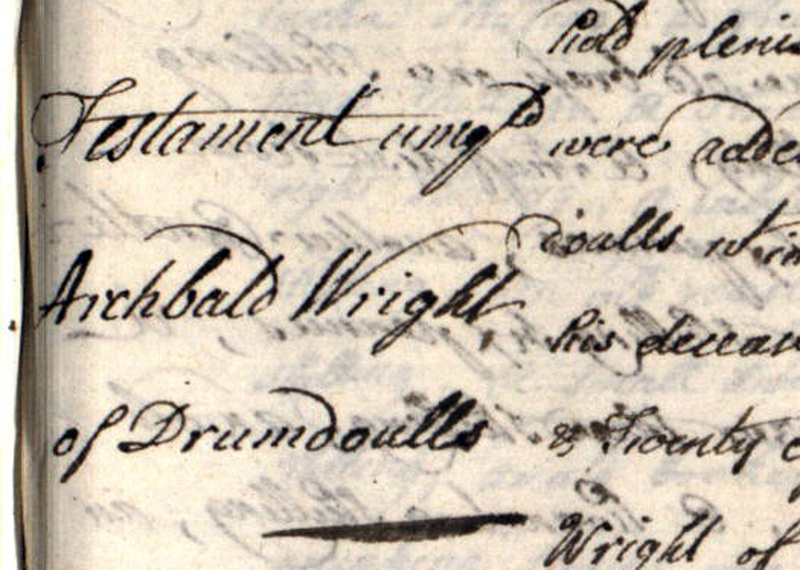 From a family paper, which is an extract from the Logie Kirk registers, we learn that Alexander Wright wedded in the year 1672 Mary Fergus, through whom as the heiress of her father he ultimately acquired, in addition to his already extensive possessions, the estate of Freuchie in Fifeshire. But in due time Alexander, too was gathered to his fathers. He died in 1708, and his son, James Wright, the oldest of a family of three sons and four daughters, reigned in his stead. This James, true to the traditions of his race, added greatly to the consideration in which the family was held. 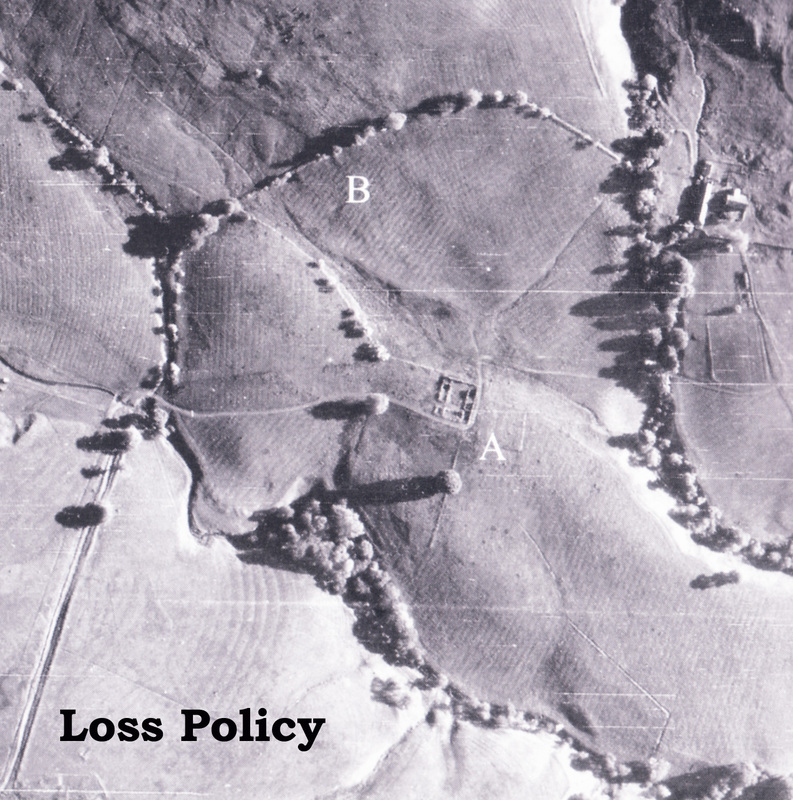 He saw that the lands of Lipnoch practically marched with the Loss lands near Menstrie. So he married Janet Galloway, the heiress of Lipnoch, and thus materially increased the territorial consequence of the Wright family. Alexander Wright had a brother called Robert. In addition to making the usual good marriage – to Elizabeth Henderson, eldest daughter of James Henderson of Westerton, portioner of Airthrey – this Robert, was so happy as to win the liking of his uncle, Robert Wright, a Captain in the Guards, who died in 1729 unmarried, leaving to his nephew and namesake Robert, the sum of £2000, which in those days represented a very handsome fortune. With this the young Robert Wright purchased the estate of Foodie in Fifeshire, and became the founder of another branch of the Wright family. And now we see the Wrights, who originally came from Burnturk in Fife, re-establishing themselves, after an absence of 300 years, as people of importance in their original borne county. This fact is quite in keeping with the tenacity and shrewdness so characteristic of the family from generation to generation in all its branches. 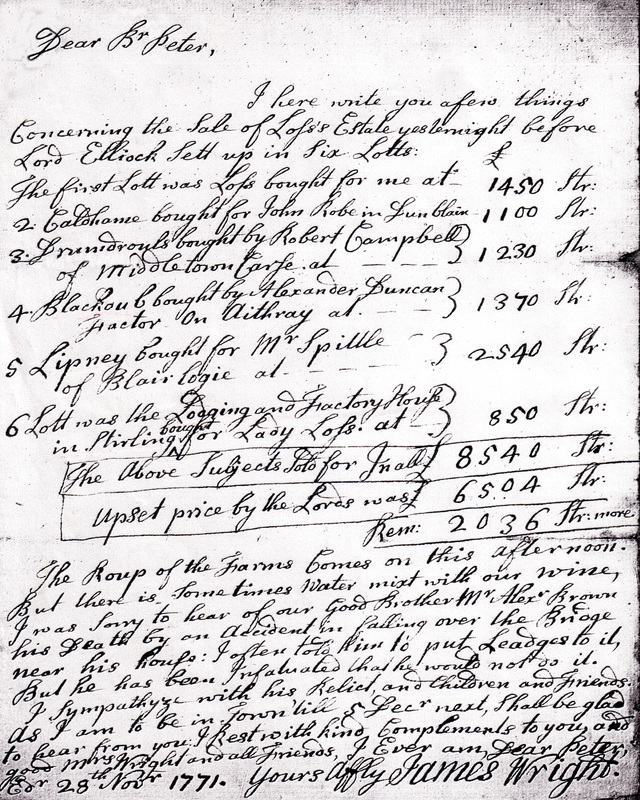 Then Robert Murray notes at the foot the principal sum and the annual rent calculated from 1689 to 1722, and ends up with the total of £566. 10s. If that sum was pound Scots, it would not be so formidable as it appears in sterling, and one cannot help thinking that Robert Murray might, have forgiven this very ancient debt and given his quittance as a wedding present to the young couple. But I must hasten over the story of this James Wright, and his heiress wife. Other papers of his time give us the picture of a country gentleman of the period, a busy landlord, and a man not untouched by the great events of his era, so soon after the ’15. There is no clear indication that any of the Wrights were Jacobite in sympathy, but perhaps an exception may have to be made in the case of this James Wright, for there are hints that he was troubled in conscience about the oaths required to be taken to the existing Hanoverian government. At any rate, there is a letter to him from Alexander Stewart of Stirling about the taking of the oath, which the scrupulous and anxious-minded James has endorsed on the back “In my defence God me defend.” Accompanying the letter is a detailed copy of the oath, which abjures the Pretender James III and VIII at great length and in unmistakable language, and acknowledges George I and “the heirs of the body of the Princess Sophia Electress and Dutchess Dowager of Hannover” as the only royal line in Britain. So the life of this Laird of Loss flowed on, and now, we see him nearing his end, and again we have evidence that he was a man of tender heart as well as of scrupulous conscience. He had two old servants, Janet and Helen Donaldson. Here then, a year before his death, we find him providing for the future of these humble dependants. There is an instrument, beautifully written on stamped paper in a legal hand by Thomas Duthie, writer in Dunblane, which bears to be an Obligation by James Wright of Loss “to make certain payments (blankets, wool, etc.) to his two faithful servants, Janet and Helen Donaldson, daughters of James Donaldson, late tenant in Torryburn; Also to pay expense of sending Janet to a sewing school for the space of quarter of a year.” His good works did follow him and gave his two faithful friends cause to bless his name for many years, for as late as 1766 there is another paper from a lawyer in Perth referring to the donation to Janet and Helen. James Wright died in 1745. His only surviving son was still a minor, and the father provided trusted friends as tutors and curators to the young James. One of these was the elder James’ brother, Robert of Foodie, and the others have names still familiar to every lover of Bridge of Allan and Logie, Robert Henderson in Blackdub, James Bryce, feuar in Logie (ancestor of the present possessors of Blawlowan), and James Ogilvie, smith in Bridge of Allan, doubtless a near relative of the “auld Paip” of Miss Steuart’s delightful book. It may have been some failure of health that led young James Wright to give up all idea of Glasgow and apprenticeship. There is a gap here, during which we may presume that he came of age, and content with the enlargement of mind that his sojourn in the capital had given him, and moreover having had some of the rusticity of a country lad rubbed off at the dancing school, where he would acquire an air and address more becoming his station in life, he determined to become the laird of Loss in very deed. About this time, too, he must have been looking with lover’s eyes at the young Jacobina Drummond, through his marriage with whom, though she brought him no accession of landed property, he was presently to become the close ally and friend of an honourable family, that of the Drummond Macgregors of Balhaldie, a property not far from his own lands of Ashentrol. 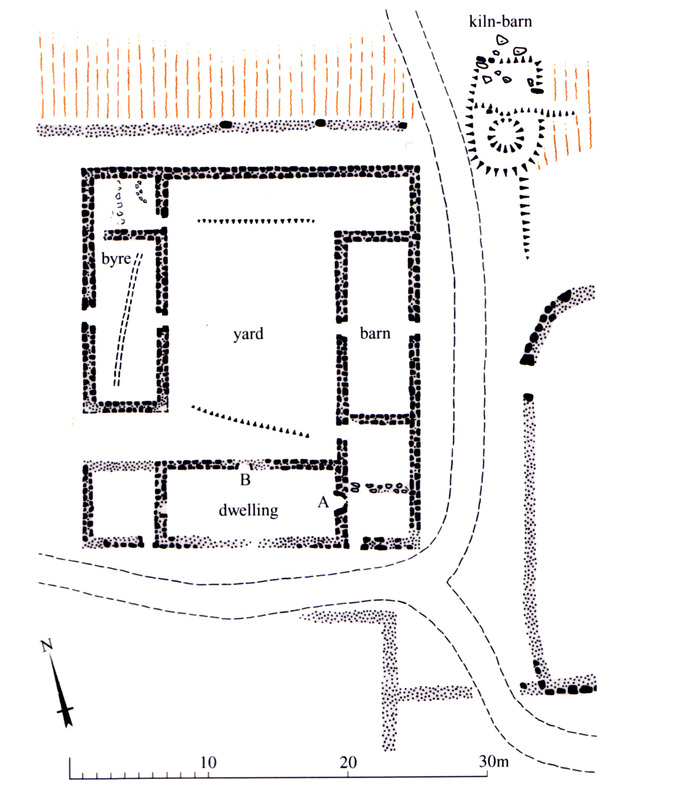 We now see him married and thoroughly settled as Laird of Loss and other properties, living, at the house of Loss in the Ochils, and, young as he was, ‘becoming generally accepted as the friend and adviser of young and old, high and low, and arbiter in innumerable local disputes. What interest he had in the affairs of John Mitchell of Bridge of Allan it is impossible to say; but perhaps his young wife had an eye to some of the articles put tip at the sale which I am about to describe, with a view to supplementing the household plenishing in her new home at Loss. For in 1751, John Mitchell of the Bridge of Allan died, and James Wright of Loss must have been concerned in his affairs and present at his funeral; else why should there be among James’ papers the receipts for the paid expenses of John Mitchell’s burial?-a coffin with rings and staples, “eall” and whisky supplied by Patrick Ogilvie of the Brigend change house, bread by Mary Morrison, “linnen” by Robert Paterson, spirits by James Alexander, and cheese and caudlo by Colin Kerr; all the requisites for the grim eating and drinking (with a long grace between each service of strong waters) so necessary. The name of Wright seems to very ancient, as we find from History, that John Wright a famous architect, constructed a bridge (Kildean) over the Forth near Stirling which upon drawing a pin separated in the middle; this stratagem being put in execution gave Sir William Wallace a decided victory in a battle fought 13th September 1297 over the English when part of their army had passed & part upon the Bridge, the Pin was drawn out by Wright himself who was suspended in a basket under the Arch and escaped unhurt. The English Army being thus divided & surprised, many were killed & drowned and suffered in the pursuit through Stirling, St. Ninians, and the Forwood. Wright was ever after that known by the Name of the Pin. The great Barony of Aithrey in the Parish of Logie near Stirling seems to have been in the possession of Wright long before the reign of James 1st, King of Scotland; one of that family Bishop James Wright baptised a son of James the 3rd in the year 1473 in the Castle of Stirling; a large hall was erected in the course of six weeks for that occasion. The Bishop’s son John was Armour Bearer to King James the 4th & by him knighted; but happening in a Duel to kill a man in Stirling, the friend of King James, he fled to Ireland where he remained till his death, His eldest son sometime after came back to Scotland & endeavoured to get a gift of his father’s escheat but to no purpose; so he was obliged to take the farm of Nethertown of Inverallan, where he & his heirs laboured for several years. The last of that name left a son James & a daughter behind him. 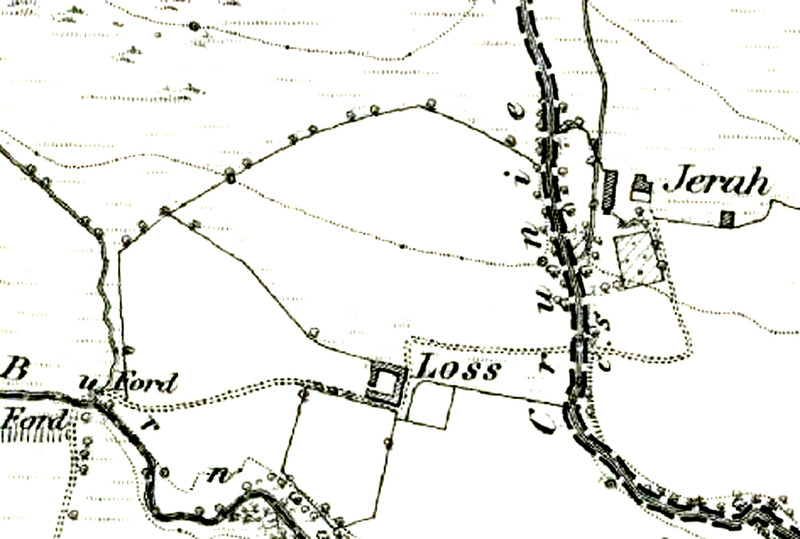 James left the Nethertown to his sister, who married one of the name of Christy, whose heirs are probably in that place to this day & he took the Overtown of Inverallan in the Parish of Lecross which he laboured all his days; he married a Marion Young daughter of John Young in the Parish of Denny by whom he had issue Patrick Wright & some daughters one of whom was married to Mr. Prow of Inverallan. This Patrick Wright had a son named James, a very accomplished, handsome man who married Elizabeth Linton of Pendreick as appears from the contract of marriage, dated October 22nd 1639 & received 4,000 merks portion with her a great sum in those days. Drummound or MacGregor of Balhadie, married a 2nd daughter of Pendreich’s which is all relationship betwixt the Wrights & that family formerly that we know of. James Wright soon afterwards purchased the Estate of Drumdrouls & Haughhead in the Parish of Dunblane & Shire of Perth & by his wife had 5 sons Alexander, Archibald, James, Robert and Patrick & two daughters, Janet & Marion; to Alexander he gave the estate & the lands of Loss, Ashentre, Caldhame, Ploverburn & Callendar in the Parish of Logie, & to Archibald the 2nd son, the lands of Drumdrouls & Haughead burthened with the Payment of 2,000 marks to his brother James, as Alexander was with the same sum to his brother, Robert, these disposition are dated at Drumdrouls, March 3rd, 1671. Alexander the Eldest, married Mary Fergus only daughter of Jas. 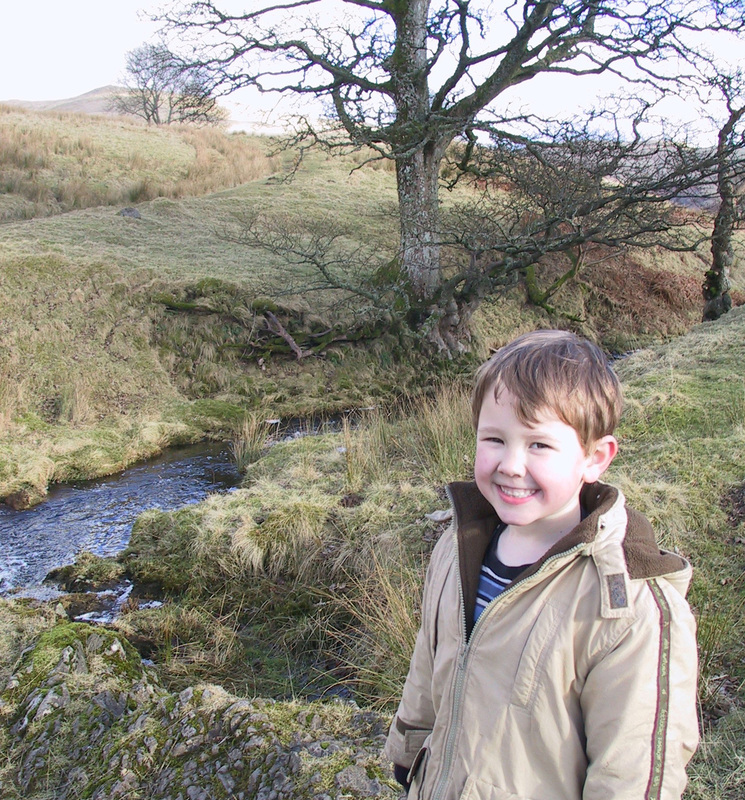 Fergus of Nethermains in the Parish of Dollar. Archibald the 2nd married Marion Prow daughter of Mr. Prow of Inverallan, a very ancient family descended from Sir Humphrey Prow of that Ilk. James died unmarried in October 1674. 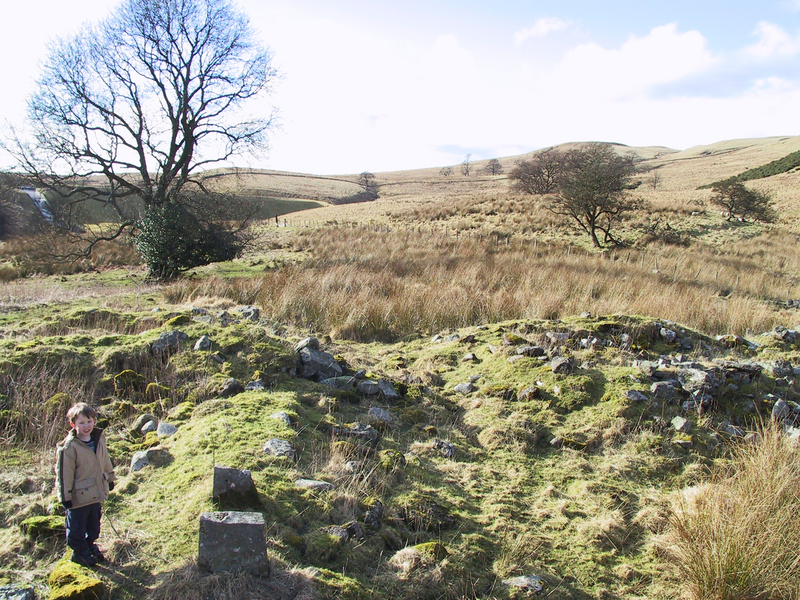 Robert died unmarried in February 1729; See the Duke of Argyll’s Pass to him in 1698. And Patrick died when young. Janet the eldest daughter was married to Robert Froot of Glenguey to whom she left no issue that survived her. Marion was married first to Mr. Home of Balquhandy in the Ochills to whom she had no issue that survived him; & then to Mr. Alexander Brown of Rutiein Dunblane; & a daughter Janet & Alexander a vintner, re the issue that she had, Janet was married to Mr. Semfile in Kylsyth, who stole her from Loss. Alex. Wright. Elizabeth Linton died in February 1672. James Wright of Drumdrouls, after his wife’s death married Jane Marshall by whom he had issue 2 sons, Andrew & James and 3 daughters, Margaret, Janet, & Katherine. 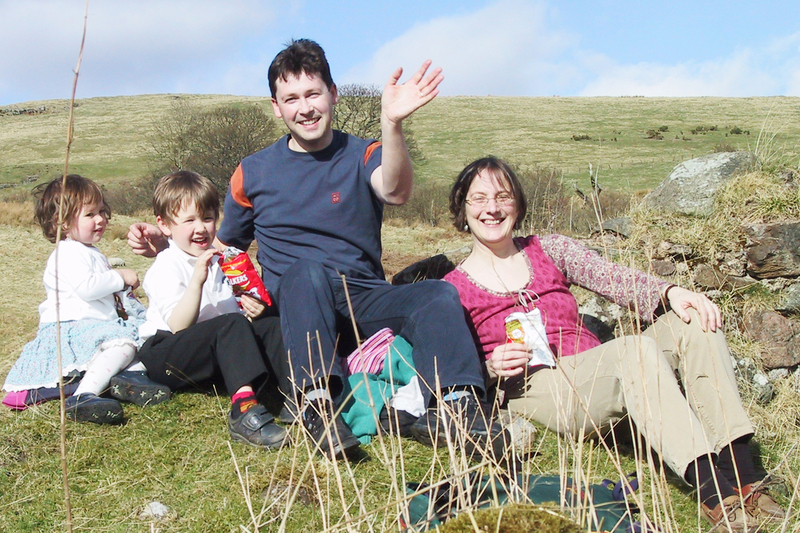 Andrew married and had children at Ironside in the Ochills. James being a merchant went abroad and was never heard of. 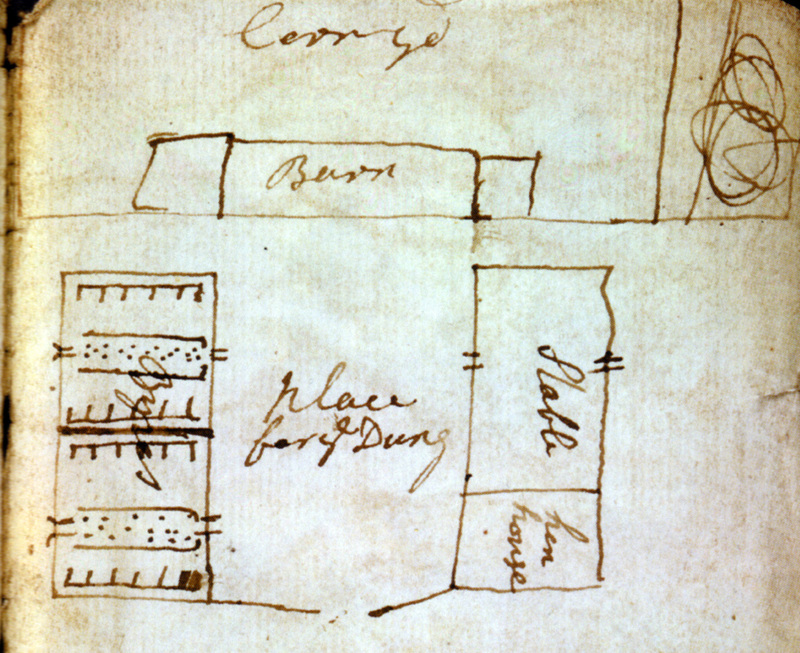 Alexander Wright of Loss by his wife Mary Fergus had issue 4 sons & 3 daughters. Elizabeth Wright, born in August 1674, Margaret Wright , born 31st March 1677, James Wright who succeeded him in Loss, was born 29th March 1679, Mary Wright born 24th November 1682, Robert Wright , born April 23rd 1688 & some other sons who died very young. Margaret the 2nd daughter died unmarried. Elizabeth was married to James Alexander Baker in Dunblane & had several sons & daughters, James, Henry & Robert, Mary etc. Mary Fergus died in November 1732. Archibald, 2nd son of James of Drumdrouls by his wife Marion Row had issue 2 sons & 2 daughters, Archibald & Shem, Elizabeth & Margaret Wright. Archibald married Jane Stuart, daughter of Sir James Stuart of Burray, by whom he had a son who died very young. Shem Wright was a Lieut. in a regiment of foot and was killed in Preston 1715. Elizabeth married David Ogilvie of Peel in Angus by whom she had issue an only son, David, who in right of his mother succeeded to the half of Drumdrouls, Margaret had the other half where she resided & died unmarried. This James Wright of Loss married Jacobina Drummond of Balhadie, they had issue but they all died young. James Wright himself died 28th November 1769 at Sterling (& I went to the internment P.W.) his widow Jacobina Drummond died also ta the lodge in Stirling, on the 10th of March 1796 in the 87th year of her age. She was a well known Oculist & had patients from all quarters of the Globe & got a husband by her skill. Robert Wright who was born as before mentioned 23rd April 1688, the 2nd son of Alexander of Loss married June 24th, 1718 Elizabeth Henderson, born in December 1698, eldest daughter of James Portioner of the Westertown of Aithry by whom he had issue, 9 sons & 3 daughters. 1. Robert Wright the eldest son was born June 3rd l719, he studied the law, never married & died in Foodie, in the County of Fife, on the, May 1769, aged 50 years, a good & worthy man. 2. James Wright the 2nd son who was minister of the Gospel at Logie near Stirling was born January 11th, 1721 & died at Logie, August 13, 1800 aged 80 years. He first married Miss Betty Hamilton daughter of the Rev. Alexander Hamilton minister of Stirling 23rd February 1748 by whom he had issue, one daughter Christian who died young & Alexander Wright born May 1752 & died a wine merchant in Edinburgh August 15th, 1798 of whom more hereafter. The minister of Logie took for a second wife October 2nd 1753 Isabel Kid daughter of Mr. Kid minister of Lucansferry (or Queensferry) then a widow of Captain Buncle of the Merchant Service, she died at the manse of Logie, February 13th, 1792. 3. 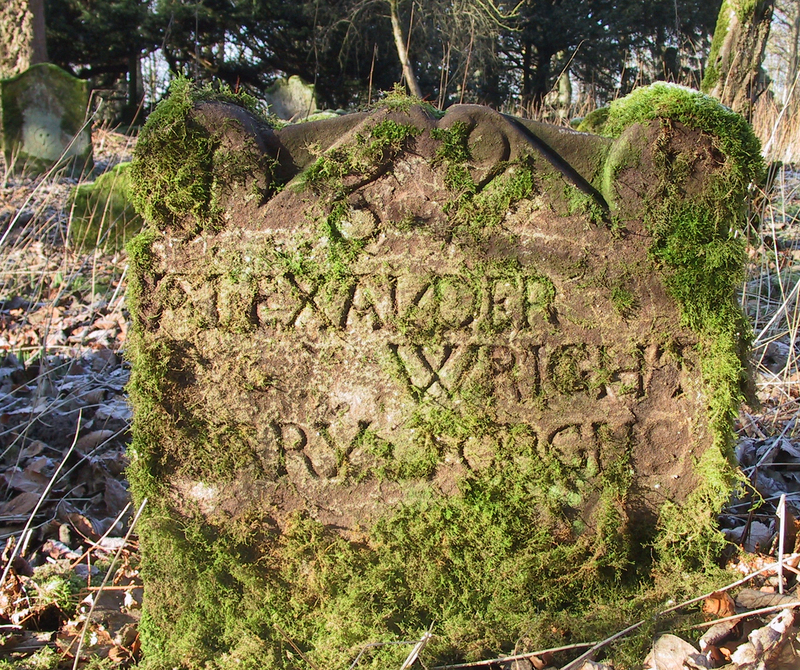 Alexander Wright born August 4th 1723 at Freuchie in Parish of Falkland, County of Fife, dies at Fredericksburg, Virginia in a pleuritic fever on the 14th March 1772 unmarried. 4. 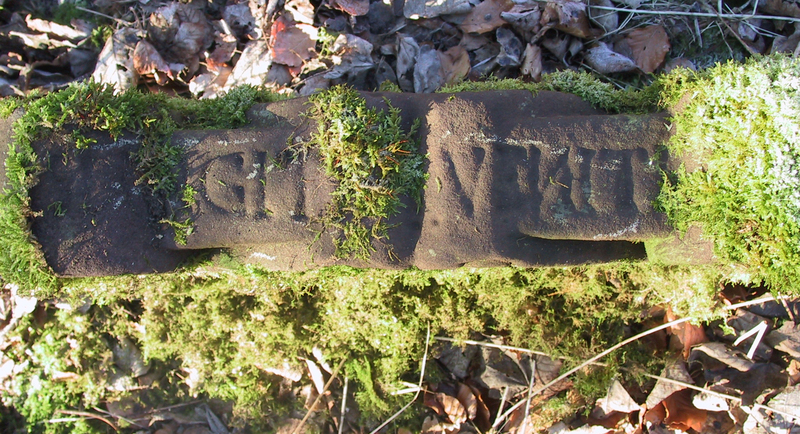 Janet Wright died an infant born the December 25th 1725. 5. John Wright, surgeon was born February 20th, 1727 & died Surgeon of a Guinea Ship at Anamaboo in June 1792, he married January 25th 1753 Miss Hannah Frependen of Cambridge, New England. By whom he had several children & by the latest accounts were John, Peter, Robert, Betsy, Margaret & Fanny, however by a letter dated Virginia April 28th 1780, from his Eldest daughter, then wife of a Dr. Shield, she mentions her 3 sisters & 2 brothers John & Robert being well, so that what was understood to be Peter might be Margaret or Patty. 6. Mary Wright born December 19th 1729 married James Anderson by whom she had 2 sons, Peter (house painter) & Robert on board a Merchant Ship from the Forth he was cast away & lost on the coast of America.7. William Wright was born 26th January 1732 & was killed July 9th 1755 being then a lieut in the Virginia Provincials commanded by (that afterward great man) Col. George Washington, when General Braddock was defeated at the Ottis. Wm. was then 23 years & promised Fair. 8. George Wright born November 7th, 1733 died in consequence of a wound, which he received on his temple by a Musket Ball in the defence of Loyal Hannon, (Pittsburg) upon which occasion his conduct was highly approved of, he died at Philadelphia & his journal ends December 17th, 1758, then Lieut of the Royal Regiment Artillery. 9. Elizabeth Wright, born 21st March 1735, married Alexander Brown, writer in Airdrie, with whom she had children, Elizabeth (died young), Jacobina died at Glasgow (unmarried in 1833), Polly (now dead) who married 1st Mr. Henderson a manufacturer at Glasgow, & later married Mr. Wilson a musician (now in London) with whom she had one daughter, also George Brown born on 22nd March 1768 & now commands a Merchant Ship from London in the West India Trade. 1.Robert Wright born December 16th, 1766, married at Edinburgh, September 11th 1791 Miss Isabella Mabone, they had a daughter born July 10th, 1792 who died at Woolich of the Hooping Cough in 1795 a very lovely child. Robert is at present a captain of the Royal Regiment of Artillery & stationed at Nova Scotia; he is at the same time aid de camp to his Royal Highness Prince Edward, Duke of Kent, Captain General of the British Forces in North America. 2. George Wright born may 30th 1768, died of the chincough November 13th, 1768. 3. Margaret Wright born August 10th 1769. 4. Helen Wright born December 1st 1770. 5. Peter Wright born February 17th, 1772, married Miss Gowdie in the East Indies, a niece of Colonel Gowdie’s, then Governor of Madeira after returning from the capture of Columbo & other places on the island of Ceylon. Peter died on the 22nd of April 1796 at Rannandpatran of which place he had the command, he was very much regretted as a clever man & a steady officer, he had no child that we ever heard of being only 7 months married. 6. 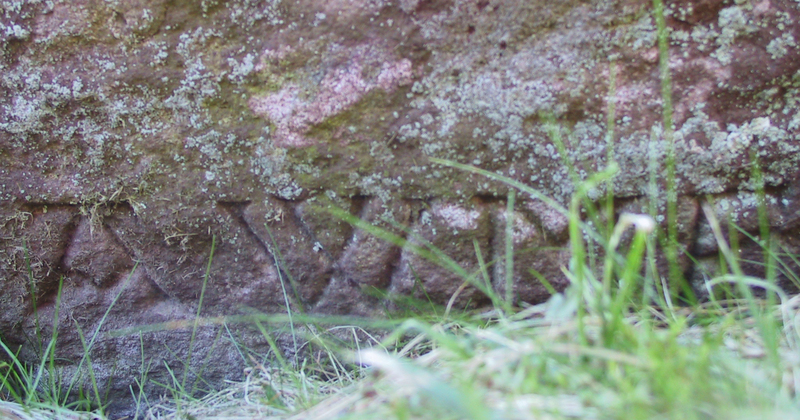 Robena Wright born Jan 21st 1774, died June 8th, 1776 at Bells Haugh. Alexander Wright (son of the minister of Logie) then a wine merchant in Edinburgh, they had one son James Wright born August 31st 1796, his father died in Edinburgh August 15th 1798 in the 46th year of his age, much respected & much regretted. 11. Charles Wright, the 11th child of Robert Wright of Foodie, was born December 30th, 1740 married Peggy Morris of Allanhill near St. Andrews. Charles died at Cupar, September 23rd, 1785, his wife died some years before him; they left an only son David, now a writer in St. Andrews. A. 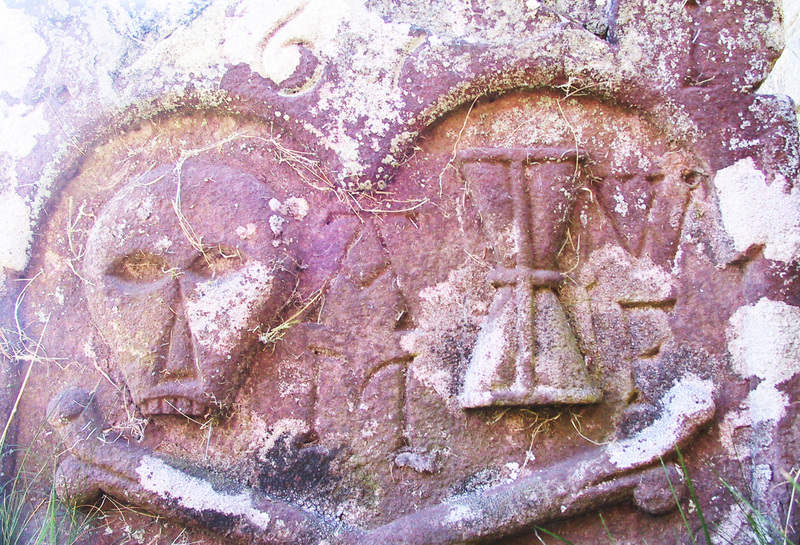 B. Wright of Foodie, Father of the above 12 children, purchased the Estate of Foodie in the County of Fife near Cupar in 1729-30 & died there December 13th, 1749 aged 61 & was buried in the Parish Church of Darsie, his funeral was accompanied by 7 of his sons; he was a good neighbour & a worthy man. Elizabeth Henderson his wife died at Edinburgh, April 1790 interred in the Chapel of Ease Burying Ground ,there on her coffin was put E. W. aged 95 which is a mistake for as she was born in December 1698 she was only aged 92. Peter Wright was at the Internment & carried her head.